My swimming coach Mike Williams decided to do his first triathlon in March and I’m super excited he used the opportunity to raise funds for Sporting Dreams. Mike helped me to win a silver medal at the Beijing Paralympics, now I’m thrilled to have the chance to cheer on in his own sporting challenge. It really IS a challenge for Mike, he’s had to over come a fear of swimming in open water AND learn to run so I’m super proud of this effort. I set out to watch a bright and early before the sun came up, and found my position on the edge of the river mouth to cheer them out of the swim exit. I was so excited to see mike charging out, and he even saw my Go Mike sign. Next it was off to find a good vantage point for the cycle and run, and I cheered him on with his wife Mel and parents who came all the way from the UK to watch. What an emotional moment to seeing him cross the finish! 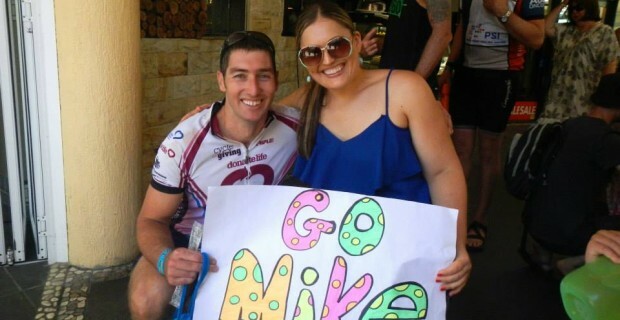 Please clickety here and support Mike’s dream even a small donation helps – I’ll really appreciate it!!!!! Even if you can’t donate, could you share this with your friends? Thanks a million!!! 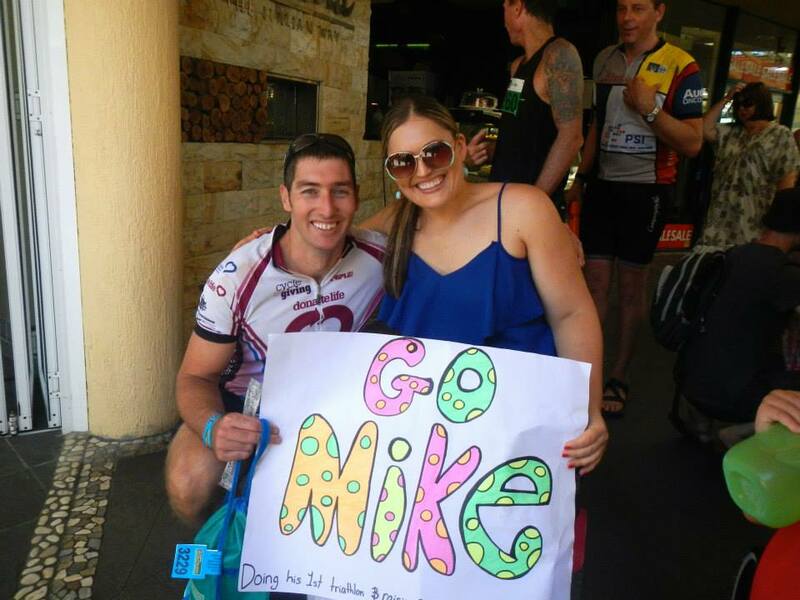 The Mooloolaba triathlon was on March 16, and Mike Swam 1500m, cycled 40km and then Ran 10km!!!! !